Hours after the Bharatiya Janata Party released six more names for the Punjab assembly polls, its state unit chief Vijay Sampla expressed his displeasure over the ticket distribution, and offered to step down from the post of party's state unit chief as well as that of cabinet minister, even as the minister denied such reports. According to sources, Sampla, who is minister of state for social justice and empowerment, is unhappy with the BJP fielding Som Prakash from Fagwara constituency as he wanted a person of his choice to contest the polls from Fagwara. Sources said Sampla is ready to offer his resignation from the party leadership and also from the cabinet minister's post if the BJP top brass doesn't amend its decision of fielding Prakash from Fagwara. However, later in the day, Sampla met party president Amit Shah and rejected such reports and said the list of party candidates had his full support. “All such reports are false. These are rumours,” he told reporters after meeting Shah. Shah is believed to have made it clear to Sampla that the party will not take any public show of dissatisfaction lightly and asked him to campaign vigrously for the state assembly polls due on February 4. The saffron party has dropped two ministers in Punjab government from the list of its remaining six candidates for the state assembly polls. With announcement of these six more names for the Punjab assembly polls, the party has announced all its 23 candidates out of 117 seats for Punjab, where it is in alliance with the Shiromani Akali Dal. 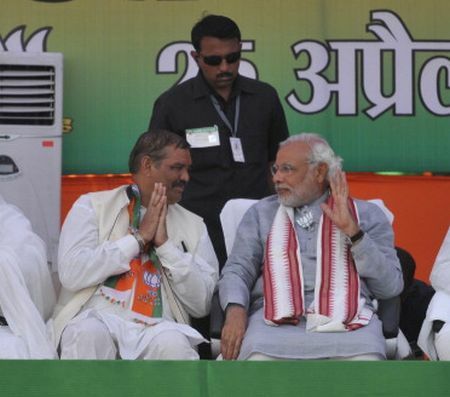 The BJP had on January 12 announced first list of 17 candidates for state assembly polls. IMAGE: Union minister and Punjab BJP chief Vijay Sampla with Prime Minister Narendra Modi.